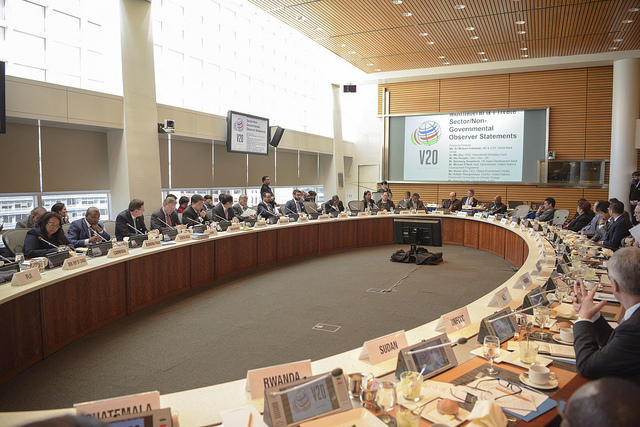 14 April 2016 – Washington, DC: The Vulnerable Twenty (V20) Group of Ministers of Finance today met to collectively address economic and financial responses to climate change as a rapidly growing threat to growth and prosperity. The V20 called for an economic and financial revolution compliant with the new 1.5 degrees Celsius and global adaptation goals as enshrined in the UN Paris Agreement reached in December 2015 that was strongly welcomed by the Group. “We welcome the new World Bank Climate Change Action Plan and are requesting additional concessional finance in the context of debt sustainability to help realize our ambitions and scale up our own contribution. We are encouraged by the progress we’ve made on climate accounting, risk pooling mechanisms, carbon pricing, and expanding financial access. We likewise expect developed countries to make good on their climate finance mobilization commitments,” added Secretary Purisima speaking at the V20 Ministerial Dialogue held in conjunction with the 2016 Spring Meetings of the International Monetary Fund and World Bank Group. The V20 gathering released a Ministerial Communique calling climate change “a weight on the global recovery” arguing that strengthened climate responses would “restore robust, sustained and balanced growth” while highlighting the “clear compatibility of economic and climate change policies.” The communique also urged the G7 and G20 to undertake urgent efforts to realign development strategies and emission commitments with the new international target of limiting the rise in global temperatures to not more than 1.5 degrees Celsius above pre-industrial levels. The V20 body approved implementation plans to advance its effort to mobilize unprecedented levels of finance from all sources including pioneering innovation in climate finance and fiscal measures to support local actions to the limits of the capabilities of the Group’s members. Decisions included a vision to implement carbon pricing regimes within the decade and calls for a Financial Transaction Tax to meet the urgent finance mobilization needs of climate action. The body also moved to create a platform for collaboration with business acknowledging the significant role of the private sector for achieving transformational change. It additionally established three Focus Groups of V20 members to specifically address the embedding of climate change costs in public and private accounting, to increase advocacy to promote V20 priorities in the international financial system, and to further work towards the creation of a V20 Risk Pooling Mechanism. The V20 was founded in October 2015 at Lima, Peru as a dedicated cooperation group of the Ministers of Finance of the Climate Vulnerable Forum (CVF), a sister-initiative. Currently chaired by the Philippines, the V20 originally consisted of 20 developing countries from Africa, Asia, the Caribbean, Latin America and the Pacific. The Washington, DC ministerial served to recognize the 23 new members that joined the CVF in 2015 as incoming members in the V20 initiative.